The Bronzeville Jerk Shack is Chicago's answer to the classic flavors and feel of roadside Jamaican cuisine. ‘Jerk’ is one of the outstanding culinary techniques of the world. Created in Jamaica in the 1600s by a fusion of African cuisine and the cooking approaches of native tribes, jerk utilizes a richly spiced marinade and a slow, grilling process to seal in natural juices and preserve nutrients. Today, all over the island of Jamaica, jerk chicken and pork are served from “jerk huts” or “jerk centers”, rustic buildings centered around the 50-gallon oil drums turned into grills from which the smoky, signature smell of jerk fills the air. The Bronzeville Jerk Shack brings these sights, smells, and sounds from the roadside of Jamaica to the Southside of Chicago. Fusing centuries-old tradition with modern service, the Bronzeville Jerk Shack offers a streamlined menu focused on the crown jewels of the traditional jerk center, jerk chicken and pork, freshly made to order. A few complementary sides and an assortment of island sweets and libations round out the offerings selections for jerk enthusiasts and enthusiasts-to-be. 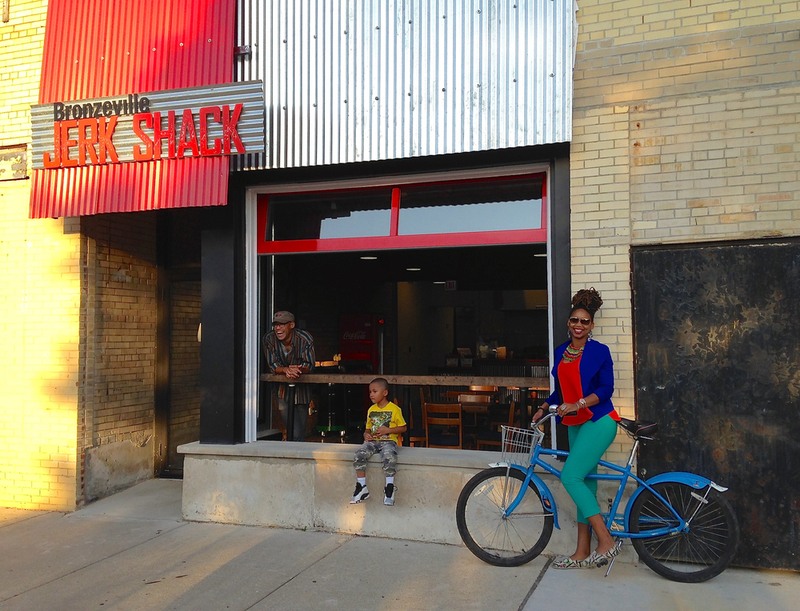 The Jerk Shack is the brainchild of Bronzeville resident Bernard Loyd. A native of Chicago, Bernard's taste buds were trained by the spicy cuisines of the West African country of Liberia, in which he spent most of his childhood. On his first trip to Jamaica, more than 20 years ago, he fell in love with the culture and people of the island and with its unique jerk cuisine. The result of a fusion of the spices and cooking techniques of the Africans, Indians, and native Arawog indians that populated the island, the spicy marinade and slow roasting process that define "jerk" cuisine produce a uniquely delicious combination of spicy, juicy, and smoky. Freshly prepared jerk pork and chicken are about the tastiest foods anyone could have; and, jerk is the island's ultimate street food. Bernard's love for jerk deepened when, a few years after this first trip, he married into a jerk-loving family of Jamaican immigrants. Jerk consumption multiplied as the family grew, and trips to Jamaica-based relatives were always accompanied by visits to favorite jerk joints, from Scotchies in Ocho Rios to countless shacks by the road and on the beach. As Bernard's love for jerk cuisine grew, so did his desire to bring the full jerk experience to Chicago: deliciously spicy food + great service + the joyful sights and sounds of the island. Opportunity struck when he decided to leave his partnership in a top-management consulting firm dedicated to assisting enterprises around the globe to focus on bringing commerce to build his own community. In today's world, the path to good community goes through good food. So Bernard - and a rapidly expanding team - purchased property and developed a plan to use food as a platform for re-development of the Bronzeville community, to create a Black version of the vibrant food destinations we know as Chinatown, Greektown, Little Italy. And there's no better place to start than with jerk cuisine! 10 years, a Great Recession, and many many challenges later we're opening our doors! The Bronzeville Jerk Shack aims to provide the best Jamaican street food and the spirit of the island, this side of Kingston. Engineer, businessman, community resident, Bernard left the rewards of "corporate" to invest in community. If the jerk is good, Bernard is there, and this is his baby. With dozens of restaurant openings under his belt, Rich delivered deep culinary expertise (and fast-fading ability to ball in the low post!). From laying out the cook line to trading off equipment options he earned his keep ... and proved his stamina. Member of the Film Stage union, and an "artiste" in his own right, Mike Beavers can do it all. He pressed "pause" on his involvement in the world of make believe and used every tool in his arsenal to lead the Jerk Shack buildout effort start-to-finish and make sure that what he put up stayed up. When the restaurant's long birthing process knocked out a previous designer, artist and designer extraordinaire Shyvette Williams stepped in to bring the project home. From the smallest awning fastener to the stain that highlights the dining room floor nothing escaped her view. She made the shack her own.